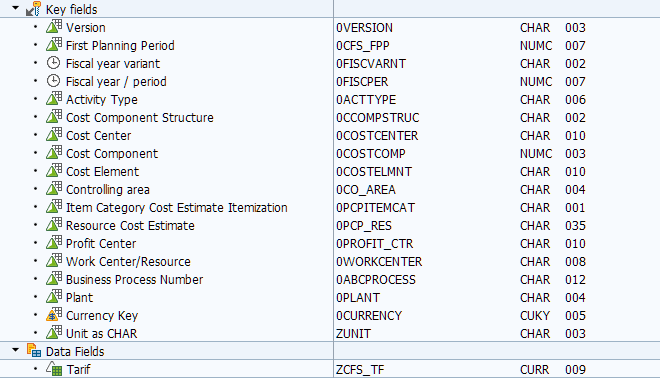 This blog describes a concept how to enhance the SAP HANA-optimzed Business Warehouse content Product Cost Forecast and Simulation by tariffs. The concept bases on the detailed product cost information, that the standard data sources can provide. SAP Business Warehouse modeling and business logic are covered in detail to explain the concept. Product Cost Forecast and Simulation has been delivered as part of the SAP HANA-optimised BI Content for SAP Business Warehouse. Details about Product Cost Forecast and Simulation may be found in our blog or the online help. 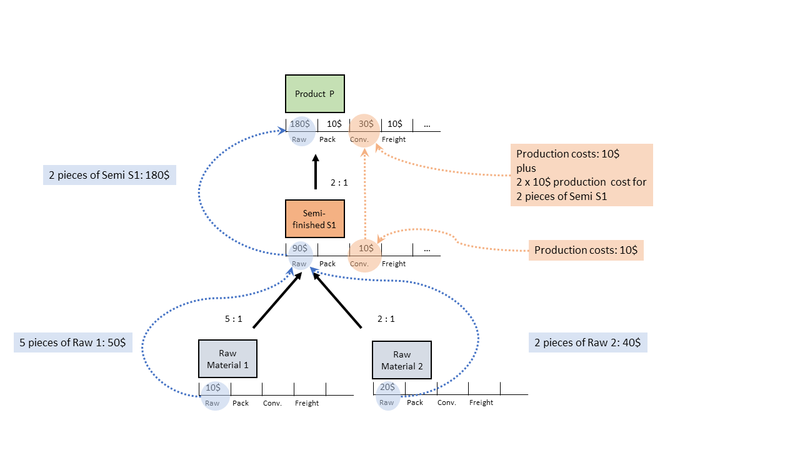 In the standard content, the impact of conversion costs – costs resulting from manual or machine-based production steps – can be simulated on a coarse level only. However, the need to forecast and simulate these conversion costs in more detail is also a valid business case and a natural enhancement to the standard content. The conversion costs are calculated from tariffs, i.e. standard rates for activities within a company. With the concept described in this blog, customers can implement the necessary enhancements to the standard content on their own. A comprehensive understanding of the HANA-optimized Product Forecasting and Simulation content and the technologies being used – namely SAP BW on HANA and SAP HANA including SQL scripts – is required. Ideally, the standard content has already been implemented and is up-and-running. The blog outlines a concept and supports this with proposals of how to model SAP Business Warehouse objects and SQL code snippets. Both modelling details and code snippets are used in this document to illustrate the concept but they are not intended to be used productively. Please read the concept thoroughly and decide, if your business needs can be covered as described. As usually it is recommended to do a proper design before starting the implementation. Other best practices like separating the development from the production and thorough testing before going into production for sure also apply here. The concept assumes that the proposed standard SAP data sources are used (0CO_PC_PCP_20 and 0CO_PC_PCP_30). Using other data sources is feasible, but in that case the concept cannot be used out-of-the-box. The data sources 0CO_PC_PCP_20 and 0CO_PC_PCP_30 can deliver the basic tariff information and the break-down of conversion costs into individual production process steps. Because the focus of the standard content is on material costs, the tariff information has so far not been used, but filtered out in the data load process. Consequently, only the content in the SAP Business Warehouse (SAP BW) and the underlying SAP HANA database need to be enhanced, no changes are required in the source system. For each product, the required amounts of materials (“Bill of Material” or “BOM”) are known. For each material, the cost component structure and costs are known. Costs can be rolled up per cost component from raw material level to each product. Diagram 1 shows this schematically, though real products are typically more complex. In this example, the two raw materials 1 and 2 cost 10 $ and 20 $ respectively. The costs are assigned to raw material costs. No other costs exist on this level, so the other cost components are not filled. The raw material costs roll-up to the semi-finished good S1 based on the required quantities. The production of S1 costs 10 $, that are assigned to conversion costs. Finally, the production of product P from 2 pieces of S1 costs 10 $ plus the conversion costs of 2 pieces of S1 to add up to 30 $. The raw material costs have been rolled-up and new costs (10 $ each for packaging and freight) are considered. The cost component information is retrieved from the data source 0CO_PC_PCP_20 and stored in the data store object (DSO) /IMO/CFS_D20. The required quantities are retrieved from the data source 0CO_PC_PCP_30 and stored in the data store object /IMO/CFS_D30. This is what the standard content currently covers. In the current example, the conversion costs that reflect the complete production process can be treated as lump sums. While it is feasible to change the conversion costs in total, a differentiated view and a simulation of tariff changes are not offered. However, the data sources already deliver a break-down of the total conversion costs per material. The concept described in this paper aims to help implement a tariff-based forecast and simulation. The total conversion costs can be broken down into several components – here manual labour and machine hours of two machines M and N.
The production of 1 semi-finished good S1 requires (in addition to the materials) 5 minutes of manual labour and 10 minutes of machine M. The tariffs are 15,00 $ and 52,50 $ for 1 hour respectively. Similarly, the production of the product consumes 20 minutes of manual labour and 5 minutes of machine N. Taking the respective tariffs into account, this sums up to 10 $. This break-down allows to simulate the production costs on a finer level, which gives a higher precision. And a higher precision is required, whenever the production costs play a more important role. Assume that an increase in wages by 1 $/h has to be simulated. In the standard content, only the sum of conversion costs could be changed: The increase of 6% in wages could be used to change all conversion costs at the same time. The impact would be the same for all conversion costs. However, we see that the wages impact the conversion costs differently, namely roughly 10% for the semi-finished good S1 and 50% for the product. This distinction cannot be made in the standard content. Remark: This is a simplification. In the standard content one could actually differentiate between semi-finished goods and products. For the sake of keeping the example easy to understand, this fact is neglected here. However, within the group of products or the group of semi-finished goods a distinction is not possible; but important for the same reason outlined here. What needs to be done to achieve this break-down? The concept describes two ways of dealing with tariffs, quite similar to the two ways of dealing with material costs: individual changes to one tariff and a driver-based approach to change several tariffs simultaneously. In our case, changing the hourly wage from 15 $ to 16 $ is an individual change. 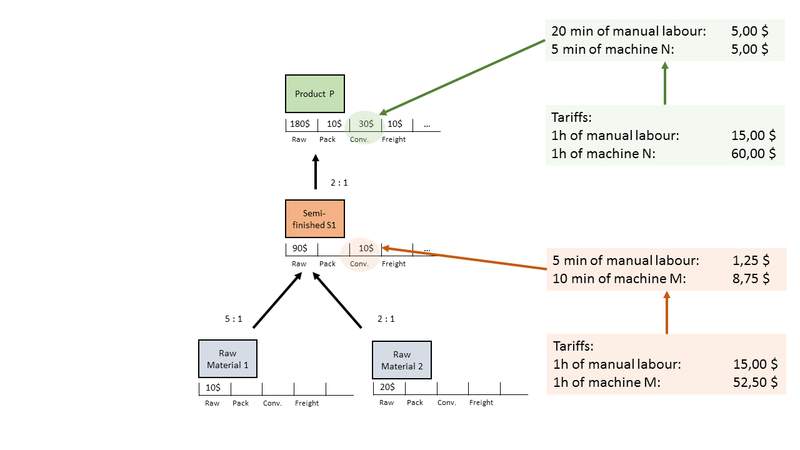 Changing the machine hour tariffs for both machines M and N because of an increase of the energy costs is a driver-based approach, changing several tariffs by one driver (energy costs). The data source delivers the amount of work (usually a time) and the costs per material. The first step is to calculate the tariffs from this information: In our manual labour example, 5 min cost 1,25 $. So, the hourly tariff amounts to 15 $. The tariffs are stored together with the individual materials. Tariffs calculated in step 1 are stored in a dedicated InfoProvider without a connection to materials: This is the base line for planning. Also, these “standard” or “actual” tariffs serve as a reference when manually planning future tariffs.Remark: Test have not shown, that different tariffs can exist for the same activity but different materials or cost components. Please verify, that this assumption is valid for your source system. Tariffs have to be unique. The tariffs need to changeable individually. From a technical perspective, this requires them to be input-ready. Correlate drivers to tariffs In addition, the already existing drivers (stored in data store object /IMO/CFS_D01) have to be correlated to the tariffs. This requires an InfoProvider similar to the correlation of drivers and materials.Remark: The grouping of materials and the introduction of so-called material-driver-segments is feasible, but not covered in the following text. The reader may decide to introduce a similar grouping if necessary. 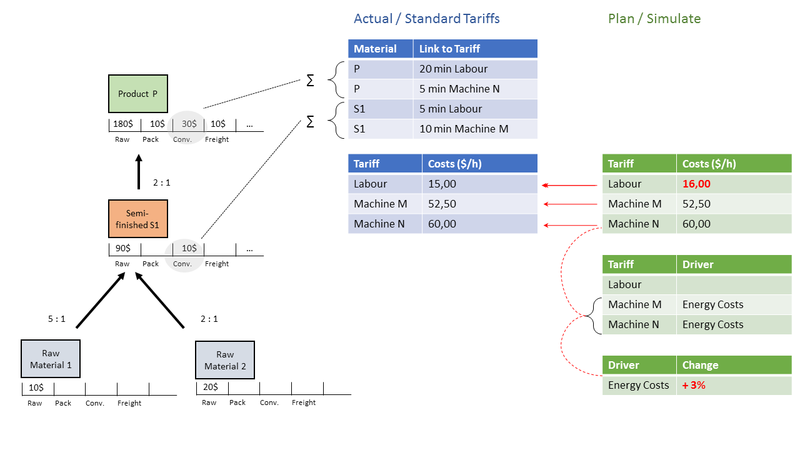 The underlying business logic has to be enhanced: The tariff-based cost changes have to be calculated and then summed up into the corresponding cost components (there could be more than one, simplified for this example).Remark: This can be done either in a dedicated SQL procedure or through enhancing existing SQLs.Once the cost components have been adjusted based on the tariff changes, the roll-up logic to calculate the total costs of a product remains unchanged. And the preparation step, that calculates how many pieces/units of a certain material are required to produce a given product (table /IMO/CFS_ITEMZTN) also remains unchanged. This chapter provides detailed information about the 5 enhancements. 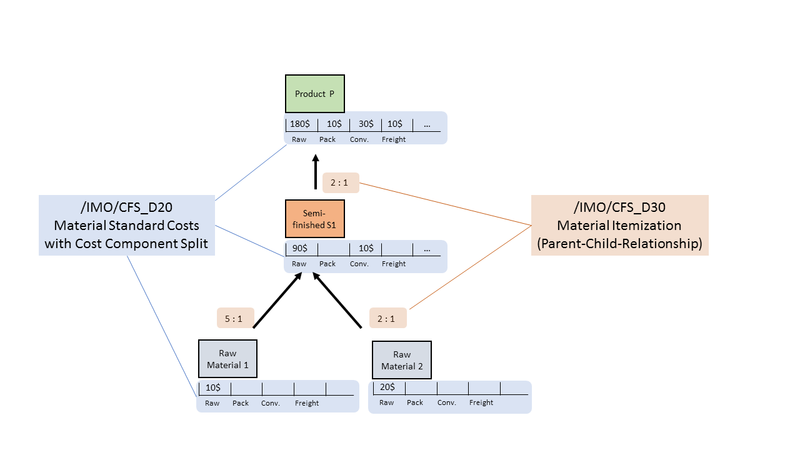 Be reminded that all data models and SQL snippets are shown to explain the concept in detail. They should not be used without verification and possibly adaptations in your landscape. The key and data fields are listed (as screen shots). Wherever possible, standard InfoObjects are used, but in certain cases new fields are introduced. It is recommended to stick to standard fields in the same way. 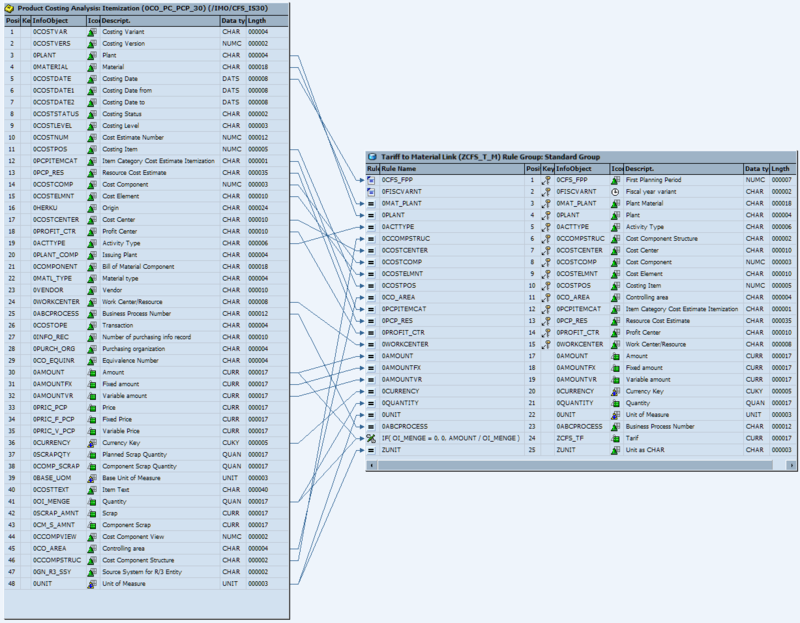 If this is not appropriate, please make sure you also adapt any subsequent object and SQL business logic. Create an InfoProvider to hold the links between tariffs and the individual materials. In the prototype, the InfoProvider is called ZCFS_T_M (“Tariff to Material Link”). In addition to First Planning Period and Fiscal Year Variant, there are two groups of keys that define the two business entities “Material” and “Tariff”: The yellow box contains the fields that identify the Material, the blue box contains the fields that uniquely define an activity to which a tariff is assigned. 0PLANT belongs to both groups. In the prototype, we introduced the key figure ZCFS_TF in which the calculated tariffs are stored. The key figure is of data type “CURR” and has “0CURRENCY” as Currency. ZCFS_TF = 0AMOUNT / 0QUANTITY. The data flow for this InfoProvider is based on the InfoSource /IMO/CFS_IS30 (Product Costing Analysis: Itemization (0CO_PC_PCP_30)). 0CFS_FPP: this field is sourced from a routine. Please use the same routine as the standard content. Check the transformation rules from InfoSource /IMO/CFS_IS30 to InfoSource /IMO/CFS_IS301 for details. The Filter for the data transfer process has to be set as follows: select “2” for Stufe and exclude the Item Categories “I”, “L” and “M”. Create an InfoProvider to hold the standard or actual tariffs. In the prototype, the InfoProvider is called ZCFS_T_L (“Standard Tariffs”). Remark: The cost components have been included. This is necessary if the conversion costs are kept in more than 1 cost component. If conversion costs always refer to one single cost component, this InfoProvider may be simplified by omitting 0COSTCOMP / 0CCOMPSTRUC. The other enhancements can then be simplified accordingly. All fields can just be moved from the source to the target. The routine for the field 0VERSION can be taken over from the standard content: Please check the transformation rule into DSO /IMO/CFS_D031. Make sure, that the Tariffs will not be summarized: Check that the aggregation rule for field ZCFS_TF is set to overwrite. Create an InfoProvider to hold the plan tariffs. 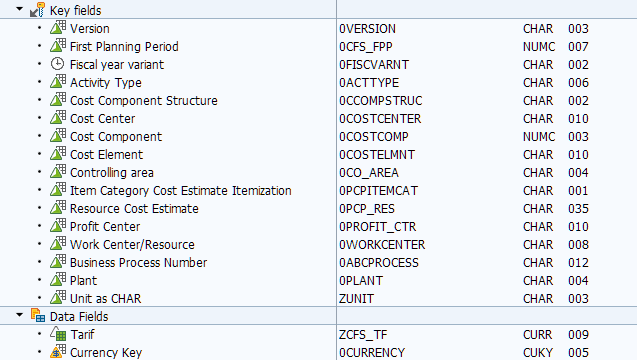 In our prototype, the InfoProvider is called ZCFS_T_P (“Plan Tariffs”). 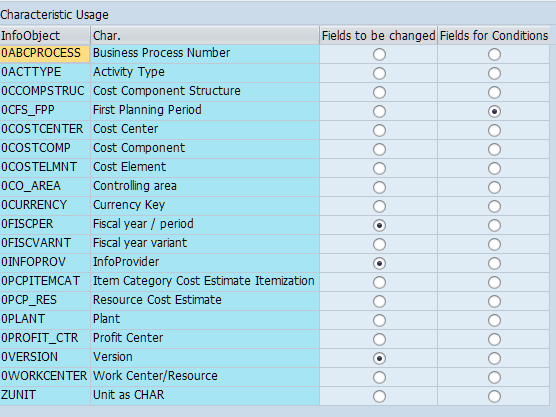 Use the InfoProvider “Standard Tariffs” as a template to create the “Plan Tariffs” as a planning enabled InfoProvider. 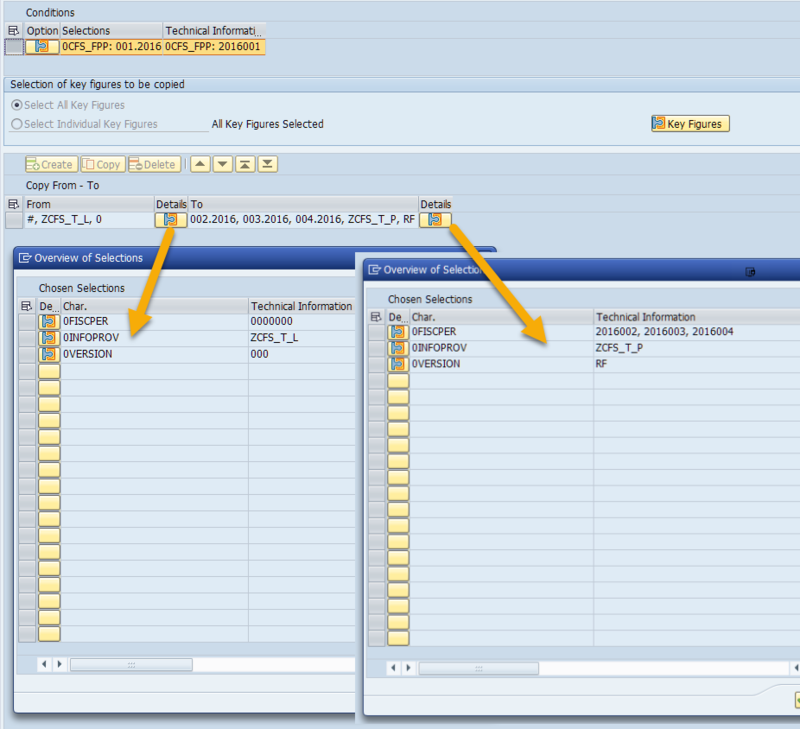 Switch on “External SAP HANA view”. 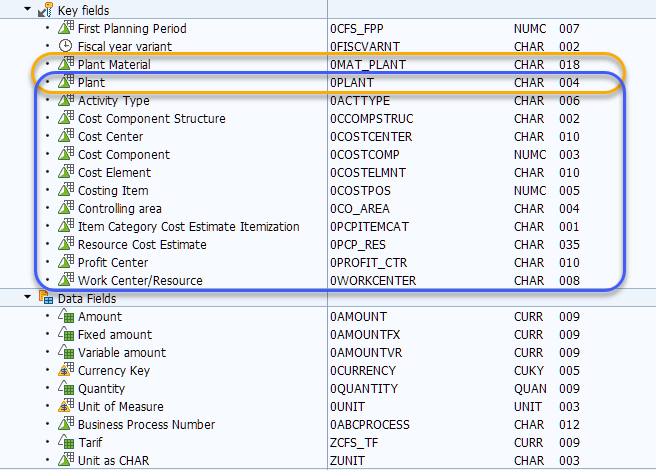 Create a MultiProvider or Composite Provider which includes the two InfoProviders “Standard Tariffs” and “Plan Tariffs”. Include all fields of the InfoProvider “Plan Tariffs”. Identify (Assign) all field to both InfoProvider, 0FISCPER will only be mapped to “Plan Tariffs”. Set the following fields to be changed: 0FISCPER, 0INFOPROVIDER and 0VERSION. In the prototype, the 0CFS_FPP has been chosen to define a condition. In the copy process, the version has to be changed from “actual” to “plan” and the InfoProvider has to be changed from “Standard Tariffs” (ZCFS_T_L) to “Plan Tariffs” (ZCFS_T_P). The data has to be copied to fill the remaining fiscal periods in accordance with the setting of the planning horizon (DSO /IMO/CFS_D05). Based on the Aggregation Level, create an input-ready query that allows to manually adjust the plan values for the future periods. It is recommended to show the standard tariff values for reference. Refer to other input-ready query in the standard content for details. The cost drivers are planned based on DSO /IMO/CFS_D01 “Cost Drivers”. The correlation of tariffs to a driver works analogously to the correlation of material groups (called “Material-Driver-Segments”, 0CFS_SEGMNT). For details, check the standard content DSO IMO/CFS_D02 “Correlation Cost Drivers”. First, a new SQL procedure has to be created (or the new logic has to be implemented in the existing procedures). The following code snippets illustrate the logic. They need to be adjusted to fit to your system and setup and must not be used productively. Remark: The code snippets do not use CE-functions, even though the standard content does. In the first step, the materials and their tariffs are read in. As common in Product Cost Forecast and Simulation, in this step the tariffs are copied over (“expanded”) to all fiscal periods defined by the planning horizon. The logic determines the driver values including the future values that may be changed as part of the simulation. The first join determines the so-called base line, namely the driver values for the first planning period. The percentage change of future value compared to base line value is calculated (“Factor”). The second join determines the correlation between drivers and their future percentage changes on the one hand and the tariffs on the other hand. As with the standard content (DSO /IMO/CFS_D21), it is possible to manually plan tariffs. In case manually planned values exist that are different to the baseline, these values are used. The last step is to incorporate the tariffs extension into the existing logic. This works similar to the concept of overwrite: The additional values are read in, in this case by calling the new tariffs procedure explained in the previous step. In the final calculation of the new material costs per cost component, the new tariff-based values substitute the original costs. This avoids double counting. There is a priority in the calculations: First the material prices are calculated – no change yet to the standard content. As described above, the standard content allows to also change conversion costs. It is not recommended to use this option parallel to the enhancements described in this concept, but if one does, the new logic “wins” and overwrites the already changed conversion costs. The highest priority comes from the overwrites. Direct entry of a future cost component always has the highest priority. This could be changed if necessary. The only procedure that needs to be adapted is SP_MTPR1. There is no need to change the output structure and consequently, all other logic can remain unchanged.